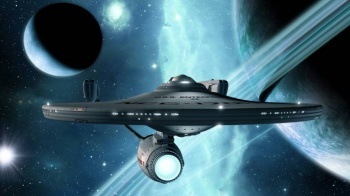 Award-winning UK science fiction author Charlie Stross hates Star Trek, and it's mostly because of the idea of "technobabble." I'm not sure if Star Trek invented the idea of technobabble or if it merely popularized it, but the franchise and the concept have become so intertwined in popular culture that it's honestly hard to imagine one existing without the other. Where would we be without Scotty telling Kirk that the Enterprise couldn't go any faster because the subspace stress on the dilithium matrix core was destabilizing the refractory alignment of the power couplings - and if it kept up, the ship was going to tear itself apart! That, says Stross, is "the antithesis of everything I enjoy in an SF novel." Science fiction, explained Stross, is interesting because it has the ability to explore "the human condition under circumstances that we can conceive of existing, but which don't currently exist." In other words, it's important to envision characters that are a byproduct of a society that possesses advanced technology - and has been shaped by said technology. For example, says Stross, is the modern-day idea of "sexting," which only exists due to the ubiquity of advanced mobile phones - an idea that thirty years ago would have been seen as very much "sci-fi." By inserting random words into the script as (tech), what good does that do to establish characters in a society that should be irrevocably changed by this advanced technology? It doesn't do that at all, says Stross. "You could strip out the 25th century tech in Star Trek and replace it with 18th century tech - make the Enterprise a man o'war (with a particularly eccentric crew) at large upon the seven seas during the age of sail - without changing the scripts significantly." You know what? I'd actually probably watch that.